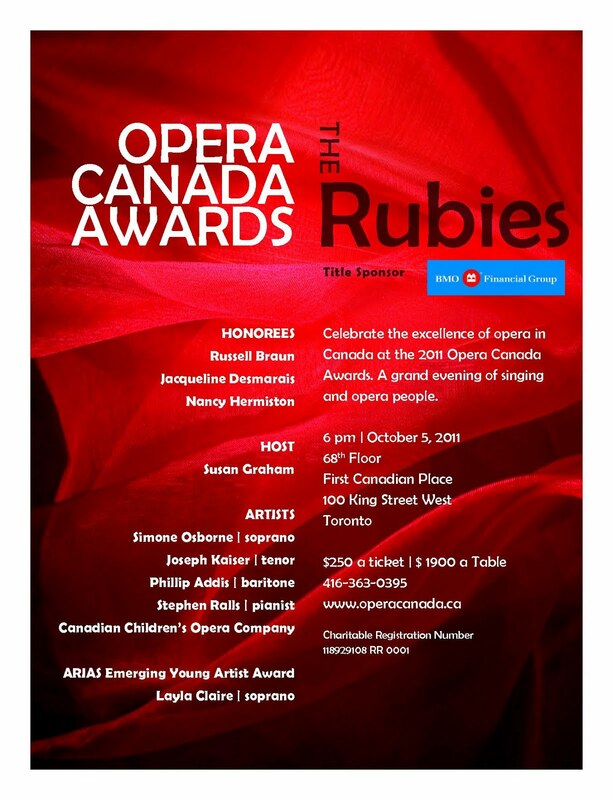 Now in its eleventh year, the Opera Canada Awards, known as "The Rubies" after the late Metropolitan Opera soprano Ruby Mercer who founded the magazine 51 years ago, will take place on Wednesday October 5. 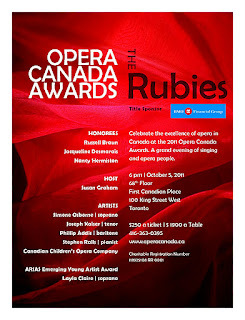 Beginning in 2000 when the honorees were contralto Maureen Forrester, pianist Stuart Hamilton and philanthropist John Cook, the Rubies have paid tribute to individuals who have made significant contributions to opera in Canada, either as an artist, an educator, or a supporter/benefactor. Among the honorees over the years are Jon Vickers, Teresa Stratas, Ben Heppner, Nikki Goldschmidt, Lotfi Mansouri, Joseph Rouleau, and Mario Bernardi. This year, the three honorees are baritone Russell Braun, soprano/educator Nancy Hermiston and philanthropist Jacqueline Desmarais. American mezzo Susan Graham, in town for Iphigenie, is the Master of Ceremonies. Performing in honour of these individuals are soprano Simone Osborne, tenor Joseph Kaiser, baritone Phillip Addis, pianist Stephen Ralls, as well as ARIAS Emerging Young Artist recipient soprano Layla Claire. The black-tie event takes place on the 68th floor of First Canadian Place. As I understand it, the event is sold out but do call for returns at (416) 363-0395. Note: In my haste of getting this entry done in time, I neglected to mention an extremely important concert - Prima Donna, celebrating 75 Years of CBC Radio. It took place Monday evening at Glenn Gould Studio, starring sopranos Isabel Bayrakdarian, Julie Boulianne, Marianne Fiset, and Aline Kutan, with the COC Orchestra conducted by Johannes Debus. I just returned from the concert, and it was truly fabulous. 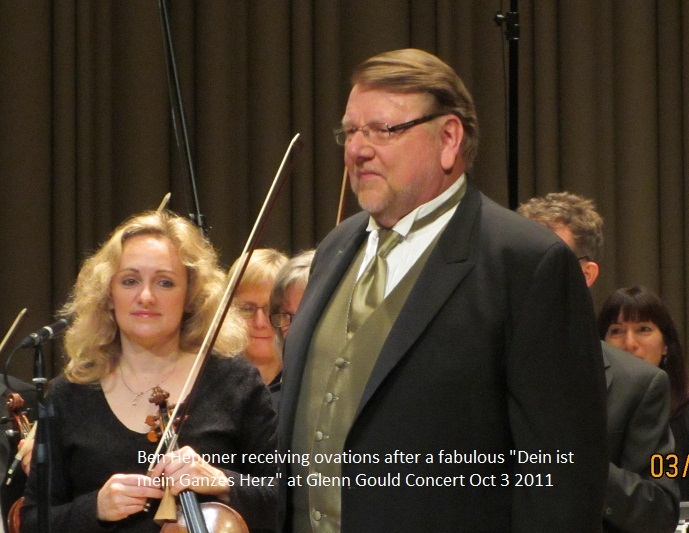 The concert was the creation of CBC Senior Producer of Classical Music Programming Neil Crory. And to top it off, the mystery guest of the evening was the great tenor Ben Heppner, who was in wonderful voice singing "Dein ist mein ganzes Herz". It was an evening to remember. 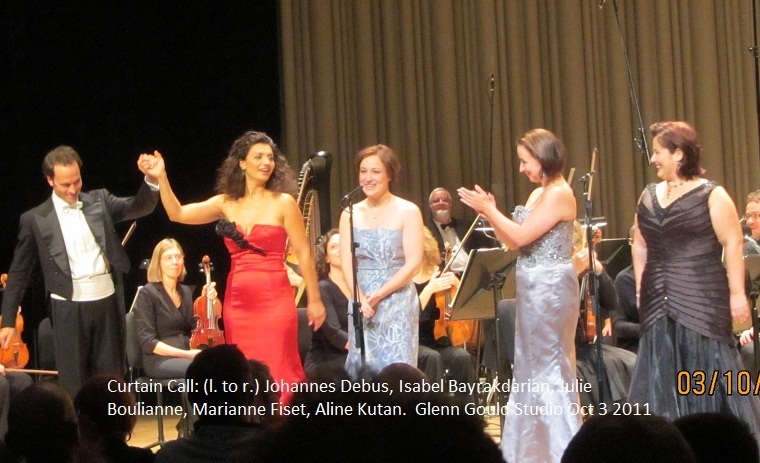 This concert will be part of an 8 hour broadcast on Sunday October 30, 2001 on CBC Radio 2 and Espace musique. It celebrates the 75th anniversary of CBC Radio. Be sure to tune in! La Scena s’implique pour la communauté !